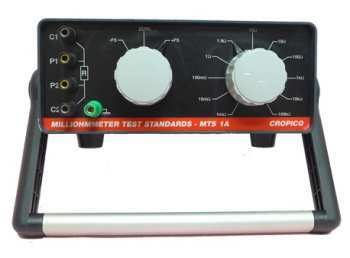 The Milliohmmeter Test Standards are designed for the simple and easy calibration of low resistance ohmmeters and Kelvin / Thomson bridges. The true four terminal resistance values are switch selected and provision is made for + and - full scale values. A four terminal zero value may also be selected, thus making zero and full scale calibration of instruments simplicity itself. Two models are available, the MTS1A which has 11 values from 1 mohm to 100 Kohm and the MTS2 which has 10 values from 400 micro-ohm to 400 Kohm.